1. First, start the simple tomato sauce. In a saucepan over a medium heat, sweat the onion and garlic in a little olive oil for 5 minutes. Add the tinned tomatoes, reduce the heat and leave to simmer while you prepare the veal. 2. In three bowls place the flour, the beaten egg and finally the breadcrumbs mixed with the parmesan and oregano. 3. Coat the veal escalope in flour, then pat off any excess. Dip in the beaten egg, again allow excess to drip off but ensure the escalope is well coated. 4. Finally, coat well in the breadcrumb mixture. Set aside. 5. Heat a griddle or frying pan over a medium-high heat. In another saucepan, bring some water to the boil for the spaghetti. 6. Cook the spaghetti as per pack instructions – usually about 12 minutes. When the griddle is hot, add the veal and cook for 3-4 minutes each side, then set aside to rest. 7. When the spaghetti is cooked, drain and toss in the tomato sauce, and add the basil. 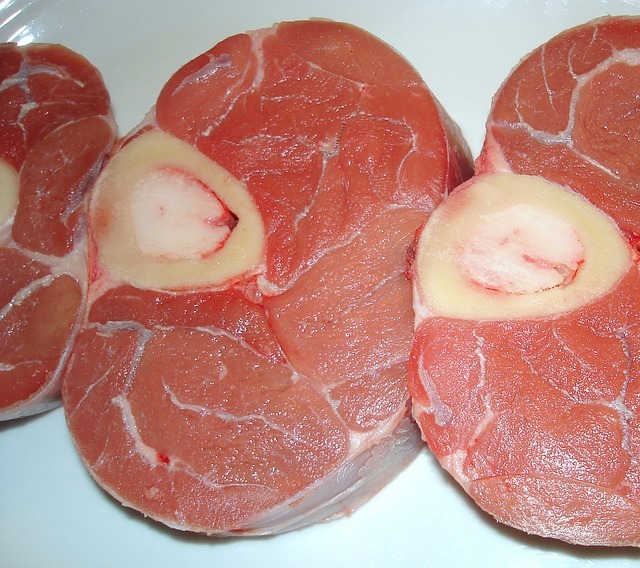 Put onto a plate alongside the cooked veal and serve. Veal is nutritionally very similar to beef, being high in protein, iron and zinc, but has a softer, more subtle taste which many people prefer. It is showcased beautifully in this classic dish. In less calories than beef, veal delivers the same benefits, such as protein, zinc and iron. It also has vitamin B, and is tender and easy to absorb into your digestive system.